When the people of Animal Aid Unlimited got a call about a stray dog hiding in an abandoned basement of the building, nothing could prepare them for the horrific scene they were about to witness. The critically injured dog was lying lifeless on the floor when they found him, seemingly just wanting to die. 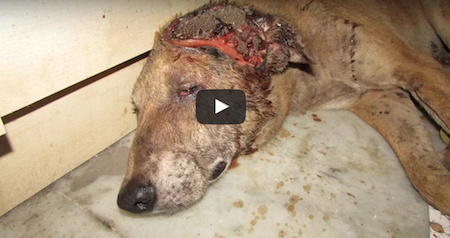 It took nine weeks of daily bandaging and care to treat the maggot infested wound on the poor dog’s head. But as you can see at the end, he made an amazing recovery and is now loving life!